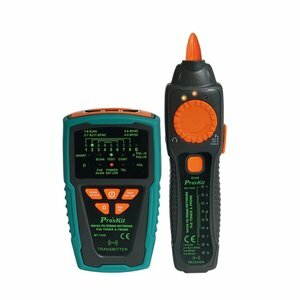 A multi-function device with LCD display for quick wire tracing, LAN cable condition diagnostic and 9 different tone cable status identification. 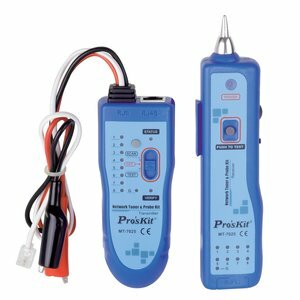 Toner and Probe Kit to validate and troubleshoot wiring in telecommunication, networking, datacom, audio/video, cable TV, etc. 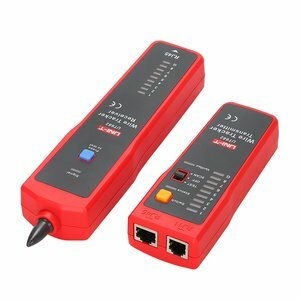 Multi-Function Cable Finder Set for Cable Identification, Toning Cable Location, Port Blinking, Wire Sequence Scanning and Loop Resistance Measurement. 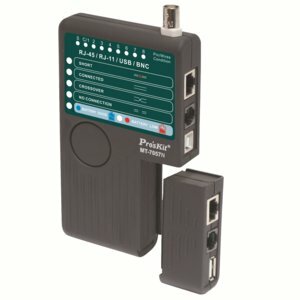 Includes a toner, a probe and 8+1 remote units. 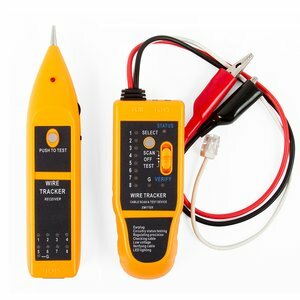 Measuring cable length up to 1200 m. Wire Tracing up to 3 km. 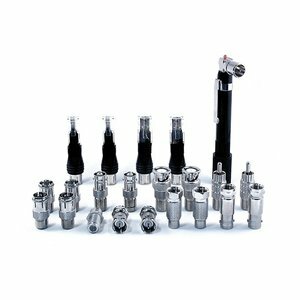 RJ45 TIA568A/B(AT & T 258A), 10 Base-T, Token ring, RJ-11/ RJ-12 USOC and coaxial BNC cables testing. 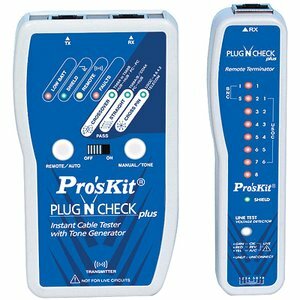 Continuity check. 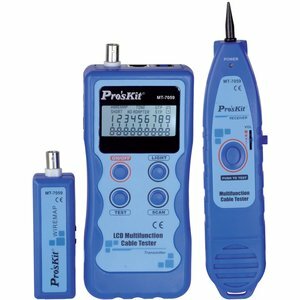 Testing telephone, LAN, audio, security or virtually any other type of wire or cable assembly. 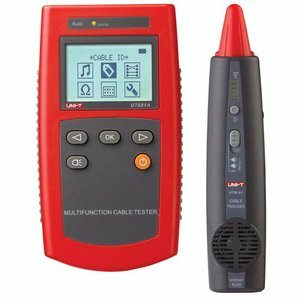 Multi-modular cable tester is applied to quickly test by auto scanning most of modular cable, USOC 4 / USOC6 / USOC 8 terminating with RJ 45, RJ12, and RJ11 modular plug, wires continuity and miss-wiring. 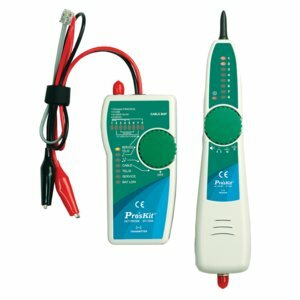 A built-in line tester verifies phone line polarity and detects voltage before it threatens the safety of the tester. 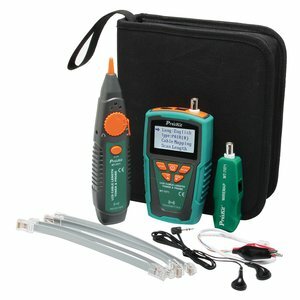 A multi-function device for quick wire tracing, LAN cable condition diagnostic and cable status identification. 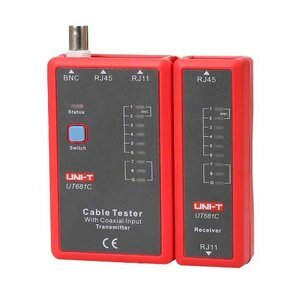 RJ-45 / RJ-11 / RJ12 / USB / BNC cable tester. 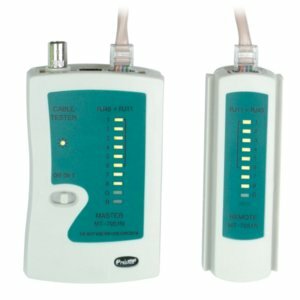 Test distance: 500 m. Tests shielded or unshielded LAN cables. 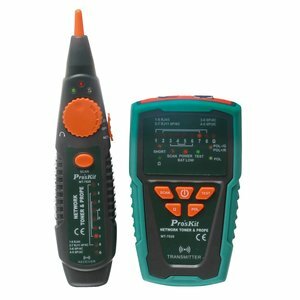 The tester is used for telephone wire tracking, network wire tracking, cable wire tracking, network wire check, etc. 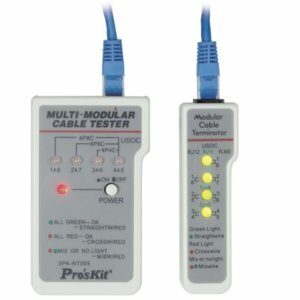 Designed for locating and verifying the cable status and wiring troubleshooting (RJ45, RJ11, coaxial, alligator clips). 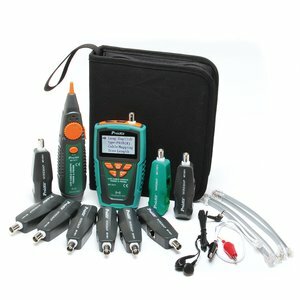 Professional tool used to test cable lines with a variety of cable connectors (RJ45/RJ11/BNC) for short circuit, discontinuity, switched cables, etc.